I Love America! Thanks, Obama! Arnaldo DeSouteiro thanks Barack Obama and the U.S. Department of State. 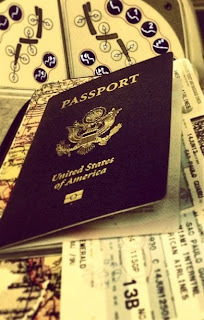 I really love America! 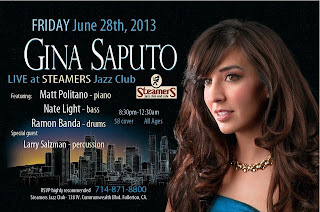 This Friday, June 28, 8:30pm-12:30am, one of our favorite vocalists in the contemporary jazz scene, LA-based young diva Gina Saputo returns to Steamers Jazz Club (138 West Commonwealth Ave., Fullerton, CA). 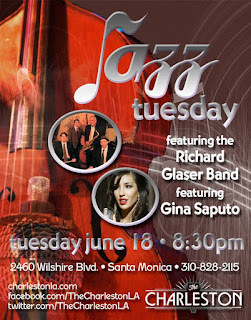 She will be backed by Matt Politano (piano), Nate Light (bass), Ramon Banda (drums) and special guest Larry Salzman (percussion). Come share an evening of excessive music loving! Come hang out with us, call (714) 871-8800 for your RSVP. As far as repertoire goes, Gina - who usually writes the setlist by hand about an hour before the show - will probably delight us with such gems as "I’ve never been in love before," "Fool on the hill," "When the world was young," "They can’t take that away from me," "Bye bye blackbird," "Exactly like you" and Jobim's bossa nova anthem "Chega de saudade" that she likes to sing in Portuguese, scatting and phrasing in a very creative way, sometimes sounds like the missing link between Carmen, Basia (check his own groovy "Explain," on which she also emulates Billie), Flora and Tierney. Not to be missed. EPs of the Month - "Patrina Morris: Even in the End / Stories I Never Told You"
Patrina was born in India to Anglo-Indian parents and moved to England when she was just 6 months old. She was brought up in North London and lived there till her teens, when she was spotted by a model agent while working in a restaurant to pay for her Art School studies. Soon she was living in Paris, Milan, Tokyo and New York, making her way in the world of fashion working for some of the most prestigious clients, appearing in Italian and German editions of Vogue, Elle and Marie Claire. Music was always her first love and after a few years she decided to make a change and began working in the music industry as a singer & songwriter.. Her projects were varied, and early on she was fortunate enough to work with well known talents such as Paul Oakenfold, Talvin Singh, Andrew Hale (Sade) and Jon Klein (Siouxsie and the Banshees). It wasn't until later when she moved to Portugal and learned to play guitar that she found her voice and began writing with Paulo Machado (bass and Fender Rhodes) and Ze Francisco Vieira (guitar) to create the sound she is becoming known for today. A year and a half ago they formed a band with Joao Francisco de Jesus (drums) and Joao Pedro Guerreiro (Rhodes), and started rehearsing and playing in Portugal. 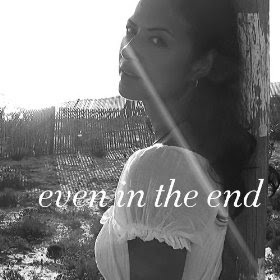 Her debut EP, titled “Stories I never told you” was an easy introduction to her sultry sound which is reminiscent of the early beach samba sound of Brazil in the 70’s, now followed by "Even in the End," which includes the songs "Keep the Faith and Believe In," "Like I Stopped Breathing," "Turn Around," "Out Here," "Love Can Make You Cry" and "How Does It Feel." With her eclectic taste ranging from Caetano Veloso to America, Toquinho, Ani de Franco, Jose Feliciano, Terry Callier, Bread, Burt Bacharach and Karen Carpenter, it's hard to define exactly how she achieves her gentle rhythm, but to her growing fanbase her bittersweet lyrics and gentle voice need no explanation. Both are available on iTunes, Amazon etc. Check it out! 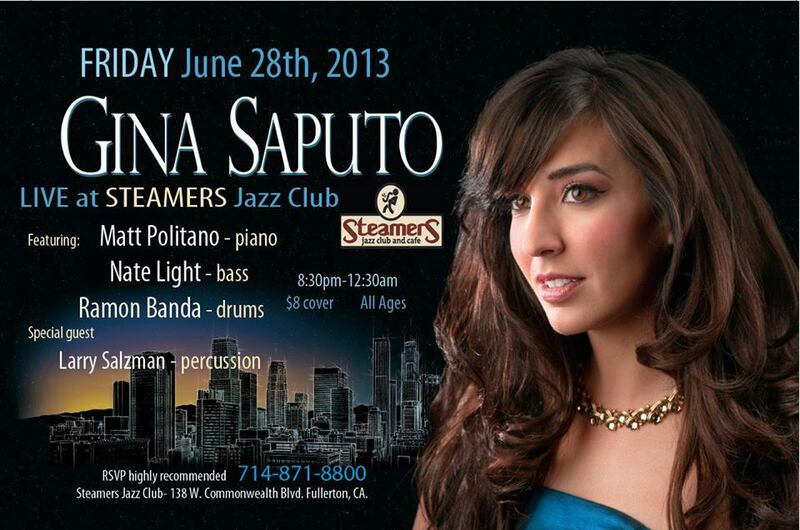 If you are in NY tonight, June 27th, don't miss the Lew Soloff/Anne Drummond Quintet live @ Zinc Bar! Trumpet virtuoso Lew Soloff is a founding member of the Manhattan Jazz Quintet, and lead trumpeter of both The Gil Evans Orchestra and The Manhattan Jazz Orchestra, not to mention Blood Sweat & Tears. Joining him tonight night is the great flutist Anne Drummond, co-leader of this supergroup that also features legendary bassist Mark Egan plus Oz Noy (guitar), Ross Pederson (drums) & Giulio Carmasi (piano). Anna Mjoll live in Beverly Hills, tonight! Tonight, don't miss Anna Mjöll and Friends Live @ The Four Seasons, Beverly Hills. No cover! 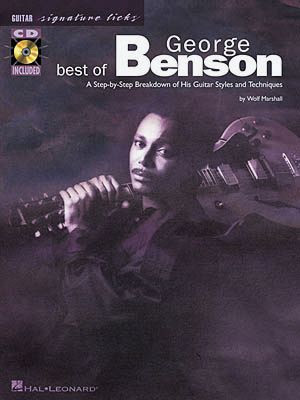 Book of the Month - "Best of George Benson"
No Cover Charge! No minimum! Great bar and menu! "LIKE" The Charleston on Facebook for updates and discount offers. This is definitely the hippest scene on the Westside! DVD of the Month - "Herbie Hancock & Friends"
Featuring: George Benson, Tania Maria, Marcus Miller, Hugh Masekela, Lionel Loueke et al. 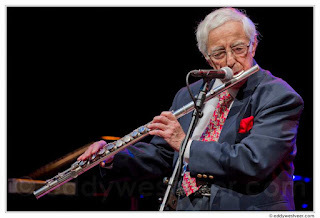 Sam Most, a pioneering jazz flutist who performed with a stylistically diverse range of artists, including Tommy Dorsey, Donald Byrd, Herbie Mann and Charles Mingus, died Thursday at the Kaiser Permanente Medical Center in Woodland Hills. He was 82. Most had cancer, said his brother, Bernard. Jazz historian Leonard Feather once called Most "probably the first great jazz flutist," who began his career playing with Dorsey. "Though his sound may not be 'legitimate' by orthodox standards," Feather wrote in the Los Angeles Times in 1978, "he is a rhythmically engaging performer whose peppery, witty style may take hold of a set of chord changes and never let go for a half-dozen beautifully constructed choruses." He also was noted for an unusual ability to simultaneously hum and play notes on the flute, a skill that he said gave his music an airy sound. Many flutists have credited him with being the first to hum and play at the same time. He developed that skill in the early 1950s, after discovering that if he hummed while he played, he made less noise with his instrument. That was desirable when he was practicing in his New York City apartment. "I found that by standing in the closet, playing and humming the same notes, I could hear myself and not disturb the neighbors," he told The Times in 1998. Most was born in Atlantic City, N.J., on Dec. 16, 1930, but moved to New York when he was 4. His Lithuanian immigrant parents loved to sing and encouraged the musical interests of their children, beginning with his older brother, Abe, who became a noted swing clarinetist. Drawn to the fast tempos and improvisation in the music of Charlie Parker and Dizzy Gillespie, Sam embraced bebop. He studied at the Manhattan School of Music and was a reed player with Dorsey by age 18. He played piano, saxophone and clarinet, but the flute was his favorite. In 1953 he released his first recording, "Undercurrent Blues," and, according to the New Grove Dictionary of Jazz, "became established as the first bop flutist." In 1954, he was voted Downbeat's "New Star." He led his own groups and played in other bands, including Buddy Rich's orchestra, which he joined in 1959. After returning in 1961 from a tour with Rich of Asia and South America, Most settled in L.A. He made more than 20 recordings for labels such as Debut, Bethlehem and Vanguard. Most, who lived in Tarzana, was a lifelong bachelor. 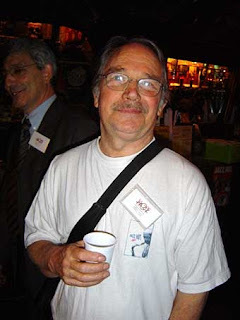 In addition to his brother Bernard, of Durham, N.C., he is survived by two sisters, Fran Tutshen and Ruth Labensky, his twin, both of Long Island, N.Y. His brother Abe died in 2002. When bassist Will Lee told me the sad news that vocalist and songwriter Babi Floyd had passed away, I remembered that the first time I had heard Babi and Will performing together was on Patti Austin's "Live at the Bottom Line." Produced by Creed Taylor for his CTI label in August 1978, it features an all-star line-up that also includes Michael Brecker, Pat Rebillot, Leon Pendarvis, David Spinozza, Charles Collins and Babi's brother Frank Floyd. Soon I took notice of other albums that Babi had recorded as backing vocalist for CTI, such as Nina Simone's "Baltimore," Esther Phillips' "Capricorn Princess" and the Yusef Lateef/Art Farmer collaboration on "Autophysiopsychic." Now, my record collection includes dozens of CDs with Babi's vocals; from Michael Franks and George Benson to Brothers Johnson, David Matthews (the great jazz arranger, not the pop star), Ralph MacDonald, Irene Cara, Tom Browne, Bob James' best-selling "Sign of the Times," and even with Keith Richard on "Vingage Winos" and "Main Offender"
Born and raised in the Chicago area (IL, USA), Babi Floyd (aka Bobby Floyd) took a B.A. in English in 1976 from Carleton College, a liberal arts college, and then headed to New York where he was sought out as a studio musician, doing background and step out vocals. By 1982, Babi had recorded on albums with Nina Simone, Jimmy Cliff, Billy Joel, Frankie Valli, Esther Phillips, Bette Midler, the Neville Brothers, Luther Vandross, Robbie Krieger, Keith Richards, and many more, having also toured with pop acts, most notably as a member of Keith Richards' X-Pensive Winos. Most recently, he was the lead vocalist for producer Danny Kortchmar's Slow leak band. Babi has sung for national and international television and radio ads, including campaigns for Texaco, Ivory Soap, Cheerios, the Army, Pontiac, Pepsi, and Coca Cola. Throughout the 80s and 90s, he has remained working with a group of commercial advertising voices which Quincy Jones dubbed as the "Super Singers." Babi made a visit to Jamaica in the early 80s and fell in love with the music and culture. Soon thereafter the love was reciprocated as he became the feature vocalist of Air Jamaica's ongoing "One Love" campaign. He has also written and produced jingles for 3 Tree Productions located in New York City. Babi co-wrote "Friendship" for Erykah Badu, and other songs for Tom Jones. The first commercial which Babi wrote and produced is a national TV spot for Tropicana. He has one solo CD, "One Blood" released in Japan, in which his love and assimilation of Jamaican musical culture is present in a mix of original tunes and covers of several Marley classics. In his songs Babi shares stories, life experiences, moments and memories in the lyrics. He expresses this style in writing for the alternative country folk scene and for gospel as well. Babi Floyd belongs to a rich musical clan. His father, A.J. Floyd, was a stride piano player who worked as a Pullman Porter performing dining cars of the Santa Fe R.R. and then as a sideman in Chicago playing honky tonk and jazz. Pearl Bailey and Mahalia Jackson were among the artists which he accompanied. Babi's grandfather, E.B. Floyd, played with Louis Armstrong and Sidney Bechet while also performing on the Mississippi river boats. Babi's grandmother, known professionally as Mama Mamie, was a popular nightclub singer in Nashville during the thirties and forties. Obituary: Babi Floyd "The Left Handed Vocal Virtuoso"
BABI BAHA’U’LLAH FLOYD was called home to be with Our Lord and Savior after a monumental struggle with illness, on June 11, 2013. 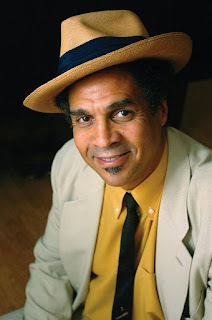 Babi, a graduate of North Chicago Community High School, class of 1972 and Carlton College (‘76) in Northfield, MN; relocated to the New York City area via Northern California, where he embarked upon a successful, colorful and varied professional music and entertainment career. Babi was sought out as a studio musician doing background vocals, Saturday morning cartoon character voice overs and countless international Radio and TV commercials. Babi passed away peacefully with his wife, family and special friends at his bedside, in Concord MA. He is survived by his wife Jennifer, three sons Tommie La’Mont (Neary) Proctor-Floyd, Seattle WA; Jermol De’Mar (Lou Ann) Proctor-Floyd, New Milford,CT and Davison Jubilance Wheeler Floyd; One brother Rev Raleigh D Floyd, and three sisters Mateenah (Bette) Floyd-Okanlawon, Stockton, CA; Carole R Floyd-Stewart and Maere M Floyd-Pitts, North Chicago, IL; six grandchildren, Mother-in-law Charlotte Anderson and a host of nieces, nephews, cousins. He was preceded in death by his parents Anne Mehu and AJ Floyd and one brother Frank D. H. Floyd and Grandparents Rev Raleigh A. and Rosa Lee Davis, and Allison E. and Mamie Floyd. the New York memorial service location and dates to be determined, and the North Chicago memorial service will be held at the First Baptist Church, 2219 14th Street, North Chicago, IL. Date to be determined. Confirmed dates to be posted on Babi Floyd Facebook page. Services to be officiated by Reverend Raleigh D. Floyd. SHM-CD of the Month: "Stanley Turrentine: Sugar"
Stanley Turrentine's "Sugar", the saxophonist's legendary debut solo LP for CTI, was recorded in November 1970 at Van Gelder Studios in New Jersey, with the sidemen cast mixing Creed Taylor's top choice session men (Hubbard, Benson, Ron Carter) and lesser known great musicians like Butch Cornell, Billy Kaye and Richard "Pablo" Landrum, an excellent conga player who would later be recruited for Freddie Hubbard's "Straight Life" album. In his liner notes for the original 1971 LP release of "Sugar" (preserved on this new SHM-CD reissue, along with additional text in Japanese), top jazz historian Ira Gitler wrote: "Turrentine has become known for a passionate, robust brand of tenor saxophone out of the swing masters like Ben Webster and Don Byas, touched by Sonny Rollins and the modernists along the way. More than any of its parts, however, is the whole of Turrentine's style; the big, vocal sound with its declarative, upper-register cries, and the powerful, Cadillac drive." 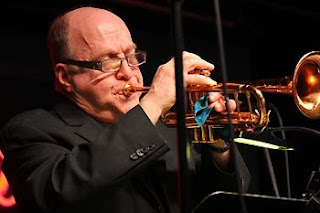 "Both organist Butch Cornell and drummer Billy Kaye are members of Turrentine's present combo. Cornell, Chattanooga born, was found by Stanley in Harrisburg, Pa. He was formerly with Willis Jackson. The particular clarity with which he articulates his lines is refreshing," Ira detailed. Although previous domestic CD issues by Sony Music included bonus material and were remixed from the 8-track tapes with controversial results, this SHM-CD reissue preserves the original mix by Rudy Van Gelder (who took care himself of the remastering) and includes only the three tracks available on the original LP release: Turrentine's "Sugar," Butch Cornell's "Sunshine Alley" and a 14-minute long version of John Coltrane's "Impressions," often used as the opening theme of the CTI All Stars concerts in 1971. The cover art (by album designer Elton Robinson) features a controversial shot by photographer genius Pete Turner. "Back in the 1960s I had done a series for Look magazine called 'Black Is Beautiful.' The image on the cover of Sugar is an outtake from that shoot, of a mother licking a baby’s foot. Some people think it’s a sexual thing, but it’s not" Turner told to Marc Myers' excellent "JazzWax" blog last year. "If ever there were a record that both fit perfectly and stood outside the CTI Records' stable sound, it is 'Sugar' by Stanley Turrentine. Butch Cornell's 'Sunshine Alley' is a solid, funky groover, paced by organ and double fours by Kaye. 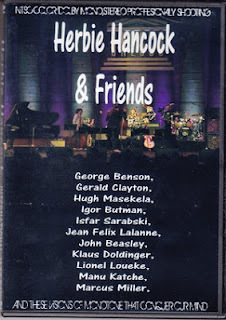 Turrentine and Hubbard stride into the melody and keep the vamp in the pocket, riding out past the blues line into a tag that just revs the thing up even further," jazz connoisseur Thom Jurek wrote in his review for the All Music Guide. It's interesting to mention that, around the same time of the "Sugar" session for CTI, Butch Cornell also recorded "Sunshine Alley" when doing a sideman date (on November 23, 1970) for Boogaloo Joe Jones' "No Way!" album for Prestige. CD Reissue of the Month - "Eddie Palmieri and his conjunto La Perfecta"
Original Album Produced by Al Santiago for Alegre Records, a division of Branston Music, Inc.
Vocal CD of the Month - "Thisbe Vos: Under Your Spell"
The follow-up to "Sophistication," Thisbe's CD debut in 2011, "Under Your Spell" brings more of the same. But in a very positive way. The LA-based singer & composer from The Netherlands returned to the same studio in Pasadena taking many of the same musicians who took part of the previous album, id est, the same rhythm section plus the great trumpeter Nolan Shahhed and the fantastic reedman Geoff Nudell, who played only clarinet on "Sophistication" but now used several other instruments that make him an one-man woodwind section. The cover art is very classy too, including detailed bios of all the musicians on the 16-page booklet. The success of the debut album allowed Thisbe and the executive producers to add a string section in a couple of tunes, with perfect results specially on the romantic title track, "Under You Spell," featuring Carl Randall on tenor sax. Once again, too, although the vocalist offers nice versions of GAS standards like Jimmy Van Heusen's "I Thought About You" (solos by Gary Matsumoto on piano and the legendary Henry Franklin on bass, a musician I admire since I was still in my teens and he was a member of Freddie Hubbard's combo), Irving Berlin's "Always" (after Tony Bennett's a cappella version on his "Bennett/Berlin" project, it became impossible for anyone to beat it) and Fats Waller's "Ain't Misbehavin'," the superlative moments come from her own songs. Nudell's fabulous overdub work on the opening "Shangai Blues" (written by Thisbe during a visit to that Chinese city) makes it an instant favorite, the album highlight along with the seductive ballad "Under Your Spell." In a completely different musical direction, "Now You Are Here" is clearly inspired by Norah Jones' early years. Nolan Shaheed's muted trumpet steals the show on the bluesy "Just A Fool Over You" (inspired by Jessica Rabbit according to the liner notes), while Nudell once again shines on the coquette "Rue de la Huchette," propelled by the Freddie Green-like guitar of Michael Higgins. Here, there and everywhere, Thisbe's beautiful voice and graceful phrasing make this album a winner. Instrumental CD of the Month - "Mark Egan, Karl Latham & John Hart: Unit 1"
So far the best fusion album released this year, "Unit 1" was actually recorded live at the small Bula club (in Newton, New Jersey) from March to May 2008. Mark Egan & Co. taped three gigs and selected their favorite moments. The result is impressive, a fiery collection of jazz classics - from Thelonious Monk to Wayne Shorter to Weldon Irvine - performed by a power trio that combines creativity, energy, swing and great grooves; something very different from similar groups that seem able only to play loud and say nothing. 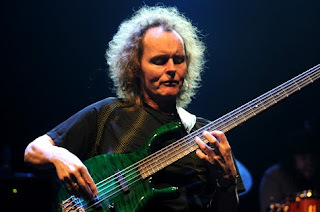 Mark Egan belongs to a brilliant generation of bassists, which included such masters as Will Lee, Alphonso Johnson, Anthony Jackson, and of course the late Gary King and Jaco Pastorius. I've been a huge fan of Egan since I bought a copy of David Matthews' "Dune" LP back in 1977, still in my native Brazil. Three years later I saw him playing live for the first time, as a member of the Pat Metheny Group, when they took the "American Garage" Tour to the Rio/Monterey Jazz Festival in August 1980. Later on, I attended many of his gigs with the Gil Evans Orchestra @ Sweet Basil in NYC, and also had the chance to talk more with him when Creed Taylor invited me, in October 1990, to the rehearsals that the CTI Superband project was doing for the "Chroma" tour in Japan. When I returned to New York in April 1991, Mark was playing every Monday night @ Zanzibar, with an all-star combo led by my late dear friend Joe Beck. For two months, I went there each and every Monday night. More recently, we met in the CTI All Stars concerts in 2009 and 2010. I've met John Hart only once, in 1987, during some recording sessions with Yana Purim at Deodato's Duplex Sound Studio in NYC that, unfortunately, were never released. Karl Latham is the only one I never caught live, but now I know that I need to do it urgently. Listening to him on "Unit 1" gave me the same goosebumps I felt when I first heard Chris Dave with Bob Hurst a couple of years ago, and Steve Gadd with Joe Farrell four decades ago. The program on "Unit 1" ranges from Monk's bebop hymns "Epistrophy" and "Bemsha Swing" to Weldon Irvine's funky opus "Mr. Clean," originally written for Freddie Hubbard's 1971 album "Straight Life" and rediscovered during the acid-jazz heyday in the late Eighties, when it became a dancefloor classic in Europe. Curiously, it's also the opening track of the CTI All Stars' "Live at Montreux 2009" CD/DVD, featuring Egan on bass. Ann Ronnell's "Willow Weep For Me," Miles Davis' "All Blues," Wayne Shorter's "Footprints," and Sonny Rollins' famous calypso "St. Thomas" receive very fresh and astonishing treatments, sandwiched by the opener "Old Folks" and the closing ballad "My One and Only Love," all brilliantly recreated. But maybe the most surprising track is "Footprints," played as a fast & furious "baião" (a rhythm from Northeast Brazil), with Egan using the bass line of Hermeto Pascoal's tune "Jive Talk," often performed by Airto & Flora Purim in the 70s, and recorded on Flora's "500 Miles Hight At Montreux." The trio interaction is astounding, and that's how all fusion bands should always sound, playing with feeling and emotion, far away from any boring acrobatics. It's almost impossible to highlight the best solos, but Mark Egan's bass flies & slides in a stunning way during his improvisation on "St. Thomas." The fluid lines of John Hart's guitar -- the man is at the pinnacle of his inventiveness, giving lessons of adventurous phrasing and dynamics, always employing the perfect level of distortion -- talk & cry on all tracks, reaching a special degree of confidence & intensity on "Mr. Clean" and "Bemsha Swing." And Latham's drums (what a musical giant!) are particularly hallucinating on "Epistrophy," "Bemsha Swing," "Footprints" and the reggae-ish take on "Willow Week For Me." Curiously, Mark Egan decided to eliminate the applauses when doing the mix. So, except for some light noise from the audience, the CD seems to be a studio recording instead of a live one. I only regret that some tracks end in fade-out. But nothing diminishes the excellence of the album, full of joy & excitement. CD/DVD Box Set of the Month - "Pau Brasil: Caixote"
It would not also be accurate to describe Pau Brasil's brilliant career in terms of "evolution," since the group already sounded perfect on its debut self-titled album from 1983 and never followed a tried & tested formula, never repeated anything. One of Pau Brasil's founders and its official leader, virtuoso bassist Rodolfo Stroeter, always took chances by changing the band members and, hence, also the group sound on each new record. Pau Brasil always traveled through different musical territories, merging the jazz freedom with complex harmonic structures, a huge variety of Brazilian rhythms (such as baião, xote, jongo etc, never limited to bossa nova or samba) and adventurous arrangements. Don't even dream to think to label them "fusion," because they somehow managed to escape from all labels, creating a highly personal identity and had the nerve to transmute it incessantly. Most of the CDs -- originally released by different labels from Brazil and abroad that agreed to license their masters to this set, made possible through a partnership of Pau Brasil Music with the giant Brazilian corporation Petrobras that sponsored a deluxe limited edition of 1,500 copies -- reappear with previously unreleased bonus tracks. Some of them recorded in studio, some during gigs or radio broadcasts during promotional tours of the albums, always relating to their original content. The box also includes a 146-page booklet with lots of rare photos and extensive liner notes by renowned music critic Carlos Calado. All albums still sound fresh and amazing, standing the test of time. Among the band members during three decades were keyboardists Nelson Ayres and Lelo Nazário (who did the impeccable digital remastering of the CDs), drummers Bob Wyatt, Azael Rodrigues, Zé Eduardo Nazário and Nenê, guitarist Paulo Bellinati, reedmen Roberto Sion and Teco Cardoso, and multi-instrumentalist/songstress (no lyrics, just wordless vocals) Marlui Miranda. Btw, Miranda shines along with the Nazário Brothers, Teco Cardoso and Rodolfo Stroeter in a splendid DVD titled "Babel" after the album of the same name that was released in 1996. Originally taped for a TV broadcast, it's an invaluable visual document of the band at the height of its creative powers, adding indigenous instruments and moods to create an artistic masterpiece. That's universal music, folks!